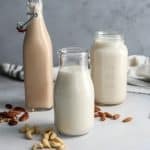 Step-by-Step How To Make Homemade Nut Milk. The process is much easier than you think. 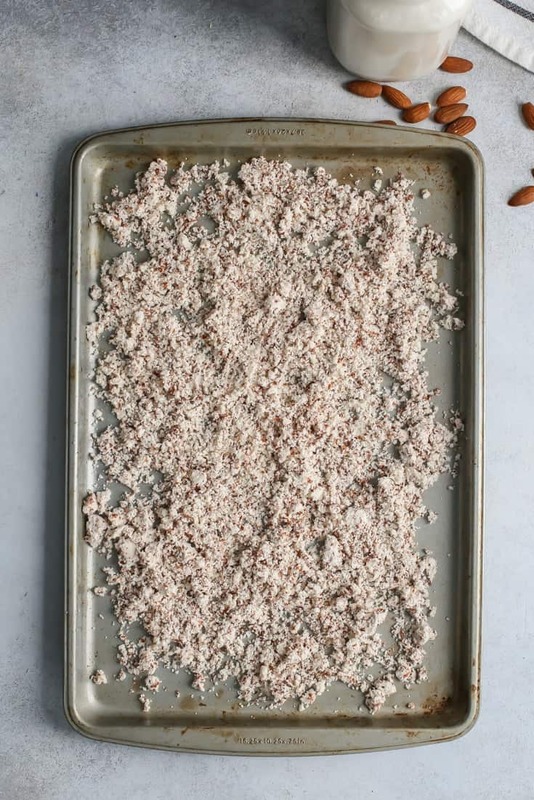 Just takes a little bit of planning to soak the nuts, then all you need is a high powered blender or food processor and a mesh strainer, cheese cloth or nut milk bag. Easily customizable. 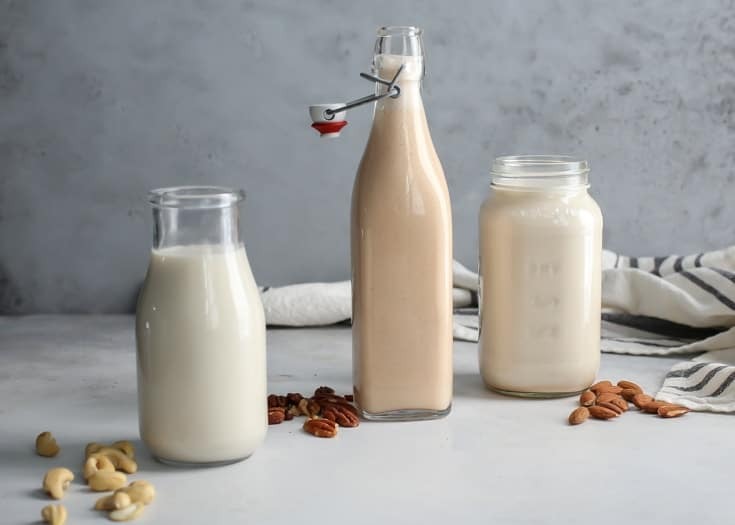 So have you ever thought about making your own nut milk at home? Maybe, maybe not? It’s kind of like making your own nut butter. 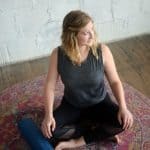 Once you do it once, you realize how simple it is and question why you didn’t start sooner. 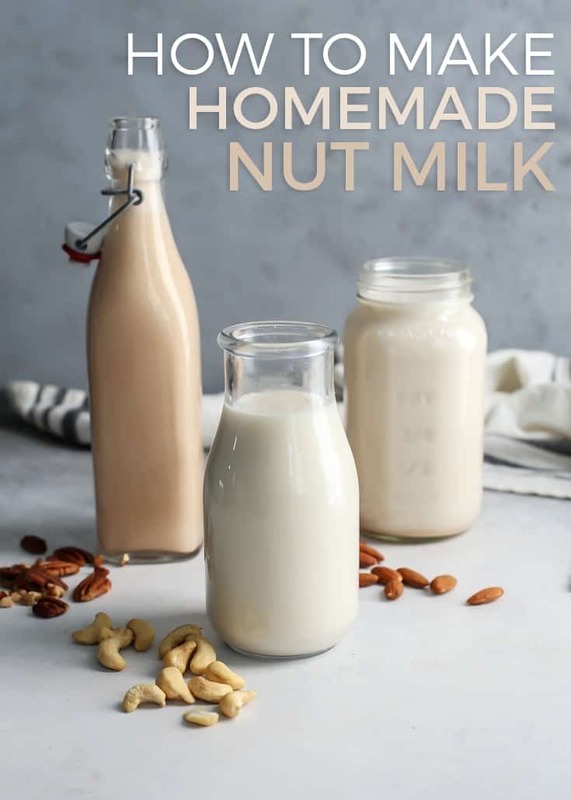 Now I will admit I am not one to *always* make homemade nut milk, but it is seriously so easy and I need to do it more often. It also tastes unbelievably fresh… duh? Oh, did I mention all you need are nuts and filtered water? We’re talking two ingredients! And if you’ve ever checked out the back of your generic nut milk at the grocery stores you know there are loads of other added ingredients in there. Not that they’re all bad, they’re just needed to help keep them fresh for a longer period of time. 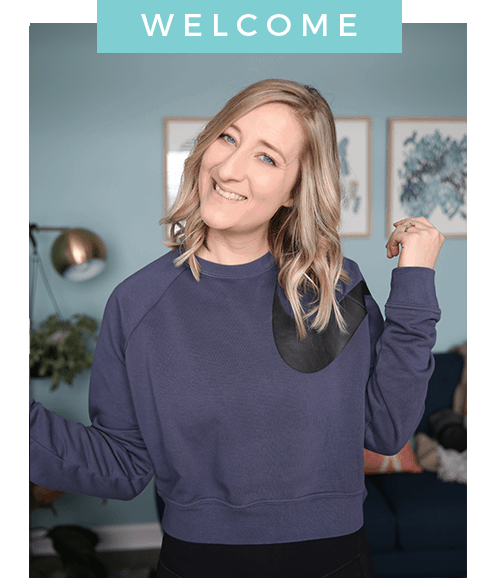 But if there are ingredients in the nut milks (often they’re blends of two nuts) that you can’t have, making your own is a great way to avoid any ingredients you might be sensitive to. Anyways, I think you should give this whole homemade nut milk thing a shot. It’s quite delicious and only takes a little bit of time. And I’ll show you what to do with the leftover nut “pulp”. 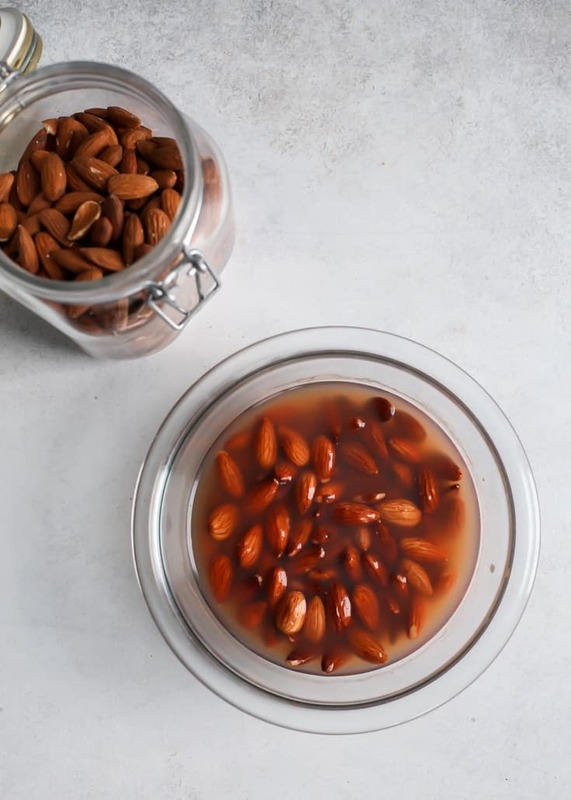 For *most* nut milks, you’ll want to soak the nuts for at least 8 hours. 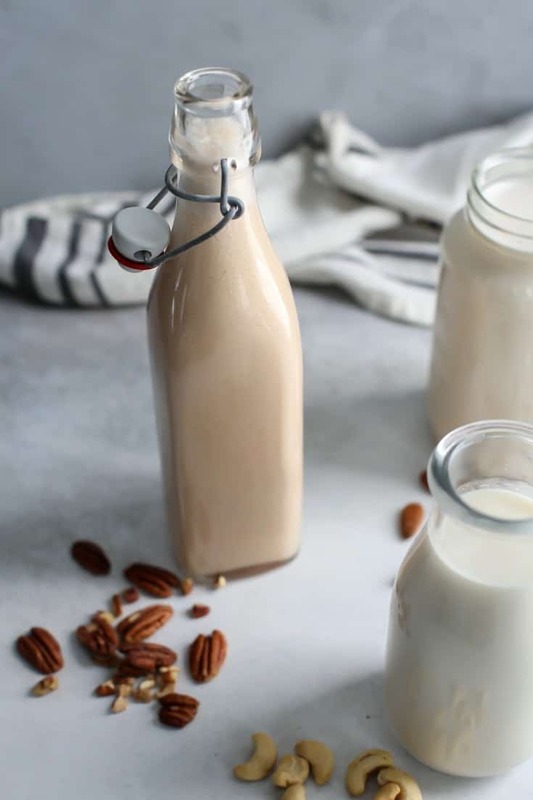 Pecan milk: I chose not to soak because they’re a softer nut. You can choose to soak if you’d like, I’d recommend 4 hours minimum. You can also make walnut milk, hazelnut or even brazil nut. And/or blends! 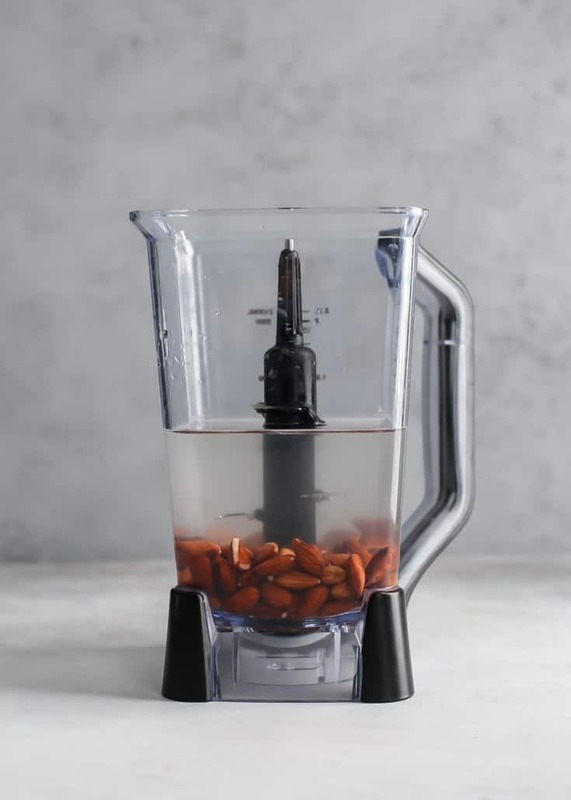 Add rinsed soaked nuts to blender with fresh water. Most nut milk ratios are 1 cup of nuts to 4 cups water. 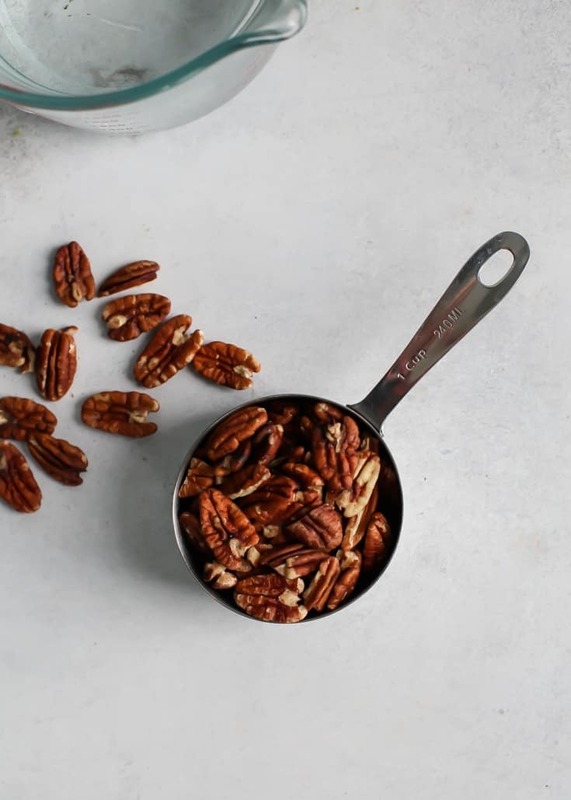 Blend the nuts with the fresh water for about 3-4 minutes–until the liquid is opaque. You can also use a food processor here, it just may take longer until the nuts are finely broken down. 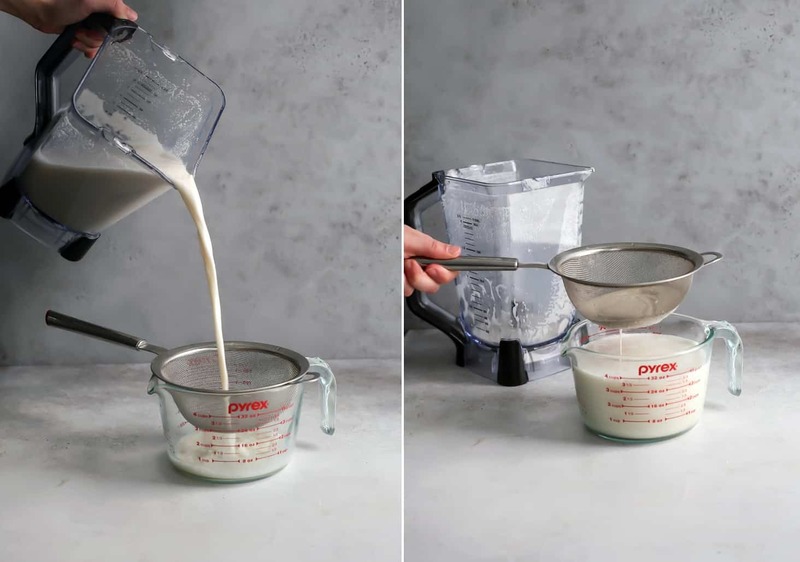 Strain nut milk through what one calls a “nut milk bag” or even cheese cloth works. Transfer milk into glass bottles or jars. 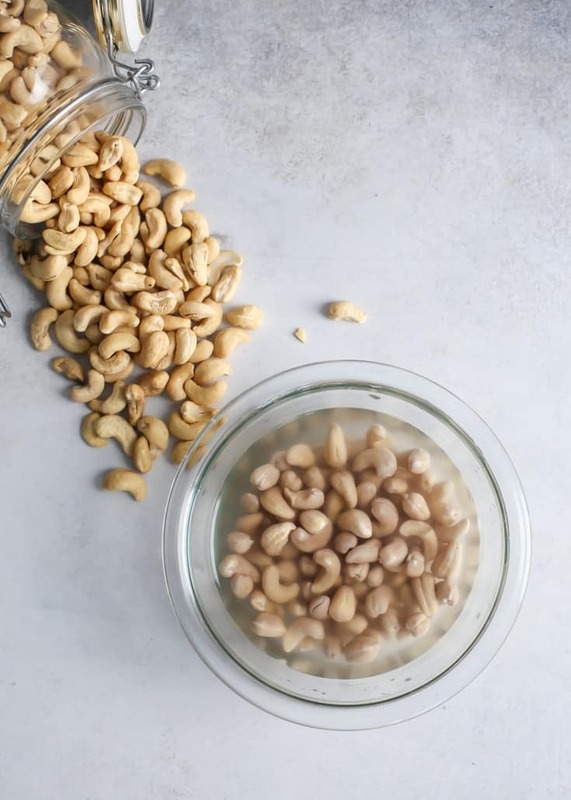 Depending on what kind of nut milk you’re making, soak nuts accordingly. I did not soak pecans but you can if you’d like. It may result in a creamier milk. 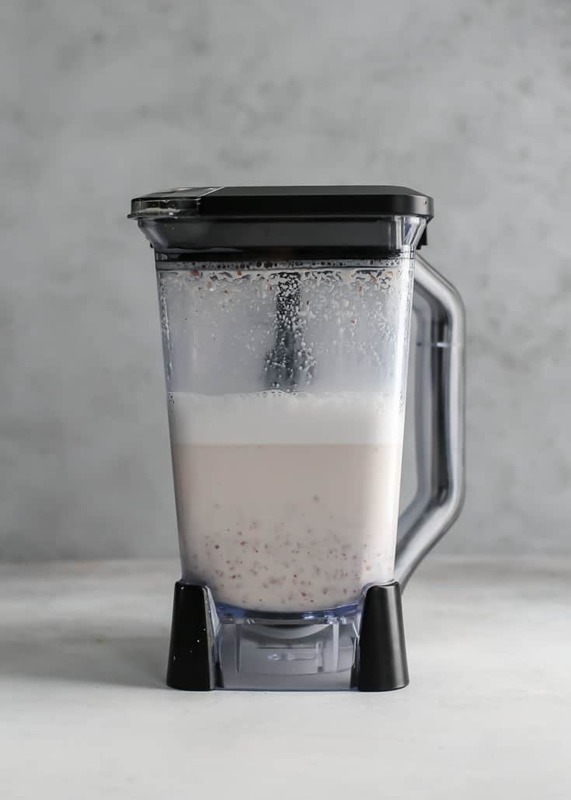 You’ll need blender or food processor, fine mesh strainer or nut milk bag, large bowl and bottles or jars. Drain soaked nuts through strainer and rinse with fresh water. Add nuts into blender with 4 cups fresh water; blend for 2-3 minutes. Nut milk should be creamy and opaque. Place nut milk bag in large bowl (or mesh strainer over large bowl or 4 cup measuring cup). 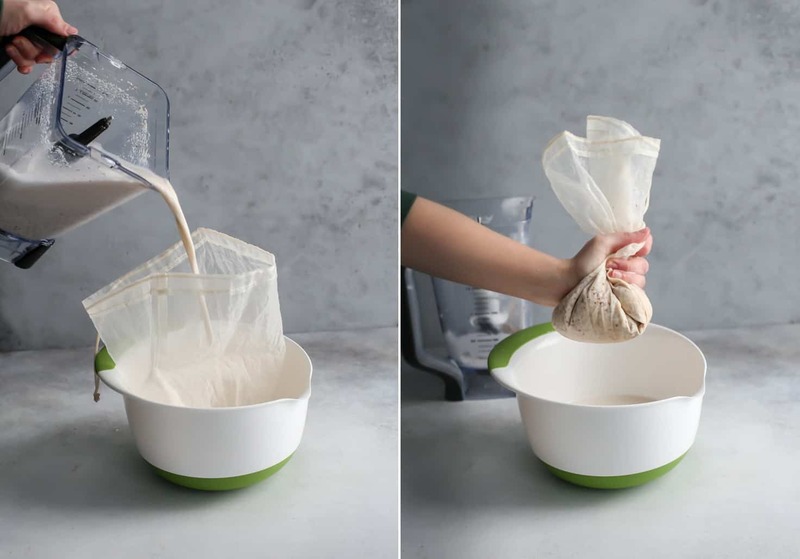 Gently pour milk from blender into nut milk bag. If using nut milk bag, squeeze all liquid out as best as you can into bowl – what is left behind is the pulp. See in post below recipe card for what to do with leftover. 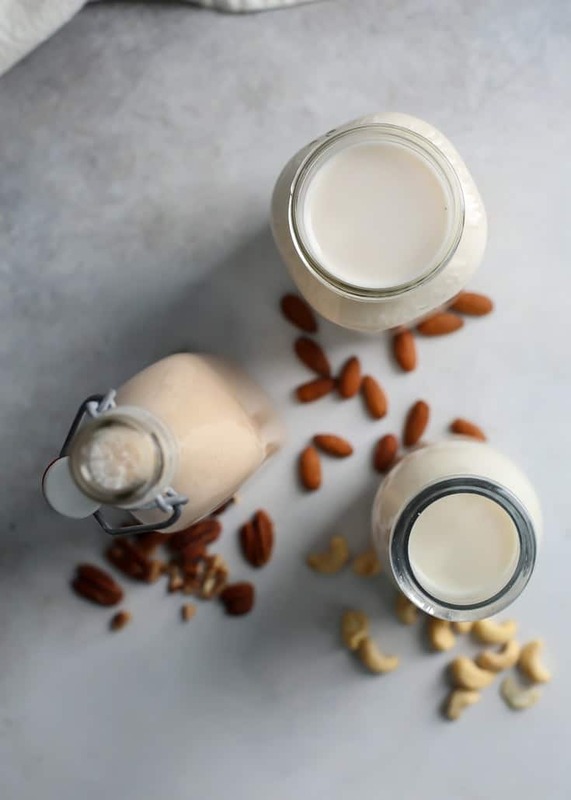 Gently pour nut milk into glass bottles – best to use a bowl with a pouring spout or use funnel. Store nut milk in fridge. Best enjoyed within 1 week. Settling is natural – just shake bottle before pouring. OPTIONAL ADD-INS: I added 2 TBS maple syrup to the almond milk, left the cashew milk plain and did 1/2 tsp ground cinnamon to pecan version. For any optional add-ins, add in during step 2 while blending the nuts with fresh water. So what’s left behind in the nut milk bag is the pulp. No need to throw it away! You can actually make almond meal from it. Bake at 200ºF for about 2 hours. Or you can use a dehydrator. I don’t have one of those so not sure on the settings. I assume similar time! Allow meal to dry completely before processing quickly through food processor. Use for baking or you can even process it further until butter forms. Wow, I love the way that you can use the pulp afterwards as well. No waste is a win win for sure. Yes no waste! It just takes a little bit of extra time but worth it I’d say! Can you do the same with cashews or just almonds? It’s essentially the same process, just the soaking time is different! If you scroll to the bottom of the page there is the recipe where I share the individual notes on each nut I used.